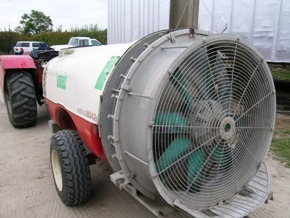 Air blast sprayers by their very nature move pesticide by creating wind to treat orchard and vineyard crops. This often places small droplets that are not intercepted by the canopy in a prime position to be carried off target. 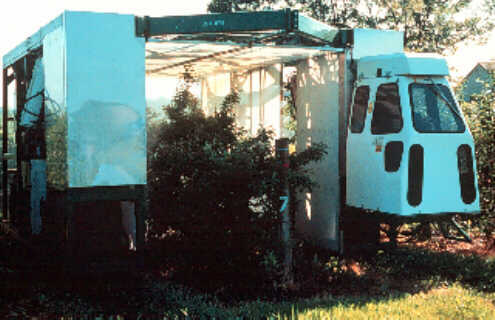 Drift can be managed by adjusting air deflectors and adding or removing nozzles to ensure the pesticide is directed into the canopy. Adjust nozzles and pressure to achieve the droplet size recommended on the label. Consider skipping the outer rows, particularly on the downwind side, to provide a buffer strip. Seriously consider planting windbreaks around the field edges to act as filters. 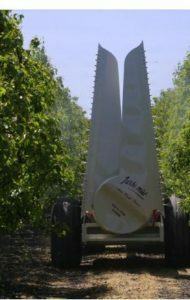 Newer sprayer designs such as tower sprayers and tunnel sprayers can do an excellent job of keeping the spray in the canopy. Where feasible, consider using these types of sprayers. Observe where the spray is being directed and make every effort to keep it within the canopy.